Don't make us start with the "Futurama" jokes, 'cause once we start, we won't be able to stop. YOU, ROBOT: You might be wondering why anyone would drop a couple grand on a robot that doesn't actually, well, do anything. 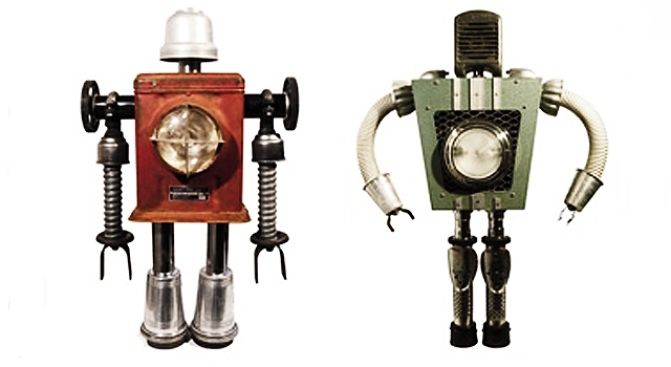 These '40s and '50s-inspired robot sculptures -- including Delta 2 ($1500) and Simplex 3 ($3300), pictured -- are made from a combo of objects found in construction sites, basements, garage sales and garbage dumps. They're all one-of-a-kind (which you normally can't say about a robot -- think about it). And while these machine people from Bennett Robot Works don't do anything except look cool, we'd say their mission is accomplished. GREAT KATE: Kate Spade debuts a classic navy double-breasted trench ($645) with a gorgeously curvy silhouette. A huge bow at the small of the back adds another noticeable touch of femininity -- as does the lipstick-print interior also featured in a few new handbags, too. We're so drooling over this one. Think the landlord would notice if we "forgot" to pay next month's rent? DESIGNER DO-OVER: Local fashion blog Capitol Hill Style launched an online resale site last week, for government types to buy and sell gently used designer gear. If you're on the hunt for bargain buys, skip the my-mailbox-is-too-small rigmarole of eBay and contact locals for your next pair of cute shoes, like these BCBGirls heeled loafers, never worn, for a negotiable $40.